The stunning Pedernales River valley between Cypress Mill and Johnson City is one of the most idyllic areas in the Texas Hill Country. River Valley Ranch, by all measures, represents the best this area has to offer. With its 1.3 miles of unspoiled river frontage, including a 20 acre natural lake with cascading runs on each end of it, rolling terrain, native grasses, majestic trees, diverse habitat, wildlife and unobstructed views that go on forever, this ranch is ready for its next steward. Less than one hour from Downtown Austin to an absolute escape from the crowds in one of the most peaceful setting that can be found in the Texas Hill Country. The owners of the River Valley Ranch chose to donate a Conservation Easement on this fabulous property to protect the unique ecological values along the Pedernales River Valley for future owners and heirs to enjoy the quiet solitude it offers. Thousands of acres on this part of the Pedernales have Conservation Easements, which ensure that much of the area will remain in its natural state and be an oasis of nature close to rapidly developing Austin. As owner of the property you would be part of one of the largest conservation neighborhoods in Texas and have confidence that many of your neighbors will not create any type of development that would spoil its wild nature. The ranch is located about 4 miles southwest of the town of Cypress Mill on paved Cypress Mill Road. The ranch is located 7 miles northeast of Johnson City and 30 miles west of Austin. Access to great shopping, golf courses and dining is close by, if one actually has any desire to leave the ranch. The ranch location is along the eastern front of the Edwards Plateau and is dominated by rolling terrain of native bunch grasses such as little bluestem and blue grama. Wooded areas consist of post oaks and live oaks, with some ashe junipers and mesquites mixed in with the oaks as well as sycamore, elm, and hackberry trees. Along the river, there are cypress, pecans and ash trees. Stands of thicker brush can be found in the under story of the trees in many areas, particularly along the multiple creeks and drainages winding down to the river. Most of the land has desirable sandy loam soils with mixed limestone outcrops. The majority of the property is very usable, with gently rolling hills that are easily accessible. The ranch owners have not grazed the ranch for years and the cover of native grasses is extensive and in excellent condition. The ranch is teeming with white-tailed deer, turkey, dove and some quail plus some feral hogs. Being kept in a natural state over the years, hunting is excellent and has been limited to just family and friends. There are no permanent structures on the ranch except for one small old barn. There are numerous roads on the ranch that are both paved and caliche covered. The perimeter fencing is in excellent condition. Several good caliche pits are on the ranch for internal use. There are also several electric service lines running through the property that allow easy access in multiple areas. This ranch sits over a very good aquifer and has excellent groundwater. Currently there are five water wells on the property, with two in operation. 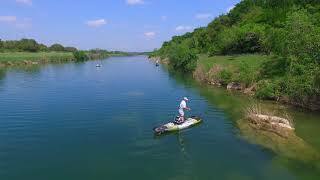 There are 1.3 miles of frontage of the Pedernales River on the ranch and it is all very accessible. The top of end of the river on the ranch and the lower area are primarily rocky outcrops with flowing water over small waterfalls and rapids. The center of the river run is dominated by Lake Lester, a 20-acre area that is deep and wide providing excellent recreational opportunities. This section of river sees very limited river traffic due to lack of nearby public accessibility. The ranch may be split in up to seven separate ranches. Each ranch may develop their own building envelope. This could also be created to have six ranches with a common area river frontage enjoyed by the up to six ranches. Cattle may be grazed with a qualified grazing plan, and horses are allowed as well. Current roads may all be maintained and new roads maybe built to access any new building envelopes. There are several caliche pits on the property, which may be used for road upkeep. No restrictions on hunting and fishing, blind placement, etc. and food plots are allowed. The ranch could also be high fenced if desired. A copy of the easement document is available on request. The owners believe they own some minerals, which will transfer with the sale of the ranch. The exact amount is unknown. There is no production on the ranch or in the area. When buying investment property the buyer&rsquo;s agent, if applicable, must be identified on first contact and must be present at initial showing of the property listing to the prospective real estate investor in order to participate in real estate commission. If this condition is not met, fee participation will be at sole discretion of Republic Ranches, LLC.